I’ve got this great DAP-1555 Draft 802.11n “Xtreme N Duo Mediabridge” that I use to wirelessly enable my Xbox 360. (You can buy these in pairs to add to existing networks. 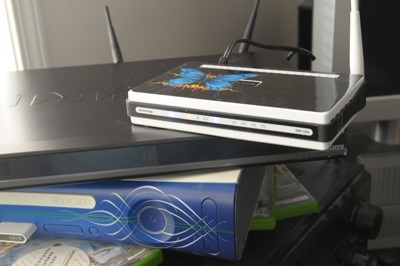 And if you want to use your 360 wirelessly, you’ll definitely want “N” speeds.) 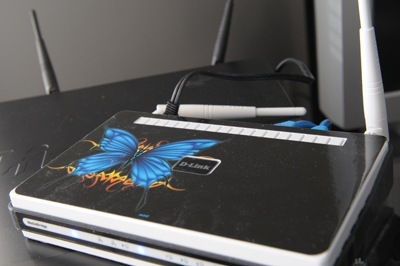 The device itself supports both the 2.4 and the 5.0 Ghz bands. In my wifi oversaturated neighborhood, the 5 GHz side is truly a neccessity! My only beef was that the stark white color made the device stick out like a sore thumb. 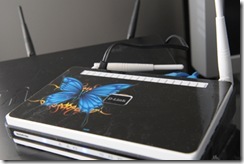 I stumbled on a page on D-Link’s web site that showed some skins for the DIR-655 router. Since the form factor for the DAP-1555 is the same, I decided to go for it. I went with a color scheme that sort of matches my Xbox 360.